I'm not trying to get calligraphic or anything (really) but I have a project where I write things by hand into an A4 journal. I know there will be corrections and editions so I have been writing only on the right page, leaving the left page blank. Well, that looks dumb. So I thought instead of using the entire page, I'd use both left and right pages, but leave a big margin for corrections and comments just like medieval manuscripts. That means I'll pencil a box of a certain dimension on each page and write within the box. 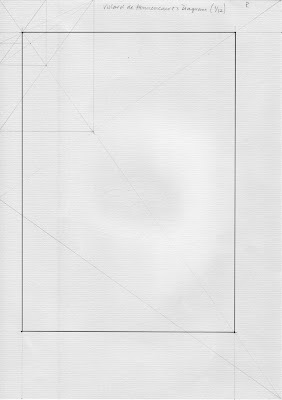 I wondered what the "proper" dimensions of the text box, or even if there were such a thing as a "proper" dimension. J.A. Van de Graaf wondered the same thing after studying manuscripts and early books of the last half of the 15th century. Using the tools and methods of the era, he derived a system of dividing book pages using a "secret canon." I traced out a few pages of my journal using the secret canon and it made my trivialities and sloppy handwriting seem important. But I was thinking that the margins were too big for my purpose. Only about 44% of the page is the text area. Well, it so happens that all we know about 13th century architect Villard de Honnecourt is on 33 pages of a manuscript of his. 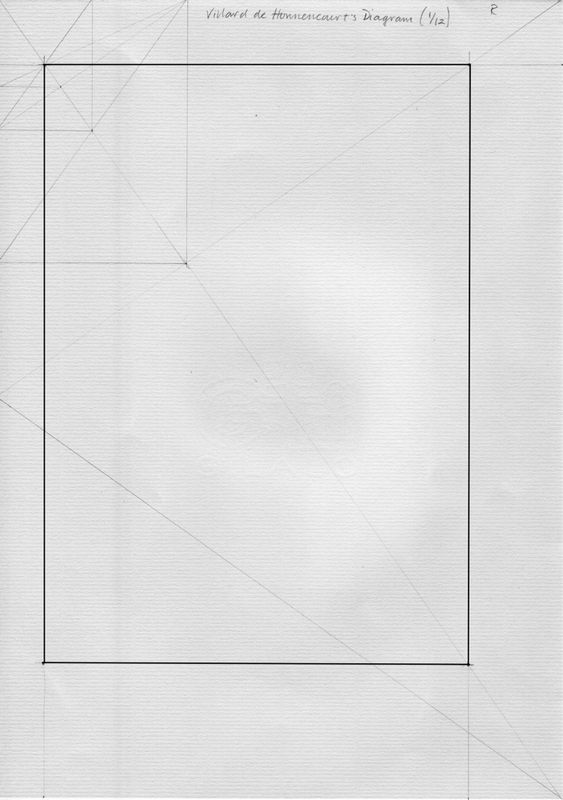 Luckily, one of those pages displays a diagram showing how to make text boxes of various sizes on a book page. The one dividing the page into 9 by 9 blocks reproduces the size and placement of a box made using the Van de Graaf secret canon perfectly. In addition, he presents a method for dividing the page into 12 by 12 blocks which gives a text area of 56%. Perfect. You can read about these systems and see some diagrams at Retinart's blog. You can watch a Youtube video showing how the Van de Graaf canon is made here. Anyway, I'll post scans of the results (pages with text in them) if anything turns out OK.
P.S. Shown are only right pages. 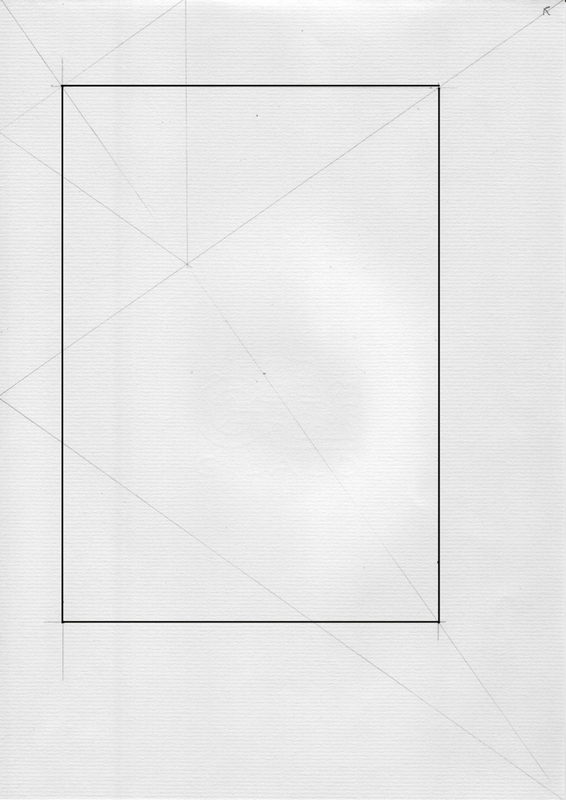 My scanner can't accommodate both pages. Is it telling that I complete the right page as the reference rather than the left? I find it very interesting and wonder how it could be used for composition of the drawing. I draw. I usually use my intuition, but this looks like fun way to organize the page. Did they use this method in illustrations too in manuscripts? I wish I could draw. It's actually on my "bucket list" the bottom of which I'm starting to get glimpses of if you know what I mean. Anyway... I used to use the entire page too, but liked this way of organizing things. I like the way the text boxes "hang" from the spine of the book. I like the structural logic using just straight lines. I'm now following your blog and looking forward to seeing more of your art! Thank you very much, Doug. I know what you mean. I also have bucket list and feel that time is running too fast, till I finish drawing the day is gone and I didn't notice if it was a day. I want to learn Japanese, I want to learn Sumi-e with professionals, not on my own and many other things. But drawing is different, you just take paper one day and try. If you are interested get a book "Drawing on the Right Side of the Brain" by Betty Edwards. I got one too. It is interesting for newbies and professionals. I'm definitely getting that book! Thanks for the tip. Hi Doug, I found your blog via FPN and I'll definitely be keeping tabs on it! I was wondering if you have any suggestions for further research into medieval page layout. I found the secret cannon in Lloyd Reynolds book, as you did, but I'm looking for more. Do you have any suggestions for a beginner?